Get that last bit of ketchup or salad dressing from the jar with ease, or quickly spread peanut butter for a sandwich. This handy little gadget is specially designed to scoop and spread your condiments down to the last drop. It doesn't matter if it is in a can, a jar, a tub or any other type of container. Using one end or the other, the Spoon N Spat will scrape clean any shape or size of container. It even fits the most narrow of containers thanks to the long, skinny scooping side. Flip it over and the other side acts as a mini spatula to spread your condiments or clean out a larger container. This tool is also great for other tasks too. Use it to stir sauces, mix batter or any number of other cooking tasks. Thanks to the soft heads it is completely safe to use with your non-stick cookware too! The whole unit is non-stick and incredibly easy to clean. You can even put it in the dishwasher on the top rack. With the Spoon N Spat you can now get that last drop and then spread it around with the same tool. This means half the mess and half as much time wasted. No kitchen is complete without one of these useful little tools. Available in red or purple. Order Yours Today! Uses Scooping, stirring, mixing, scraping and spreading. 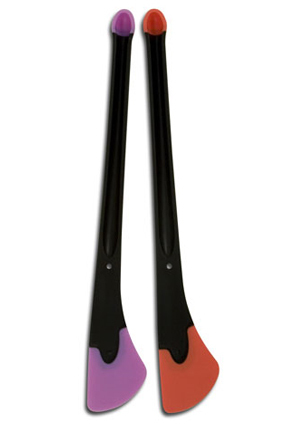 Spoon N Spat - This innovative kitchen gadget can be used for spreading, a scoopping, or stirring. Get the last bit of ketchup from the jar with the long stem scoop. Spread condiments for sandwiches quickly and easily. Order Yours Today. I love this product, that's why I ordered two. I had broken another product I got a long time ago to get the last of a product out of a bottle or jar and these seemed perfext. It's not a bad tool, just disappointed in the quality. It's small and the pliable TPR ends aren't too pliable. I foresee myself using this ONLY when I need to scoop the bottom of a jar.